Image credit: Lone Star Taps & Caps (click to enlarge). 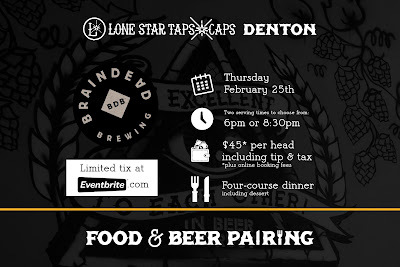 Lone Star Taps & Caps debuted its Denton location just last month, and while the new spot has held a few tap takeover-type events, it has yet to play host to its first beer dinner. 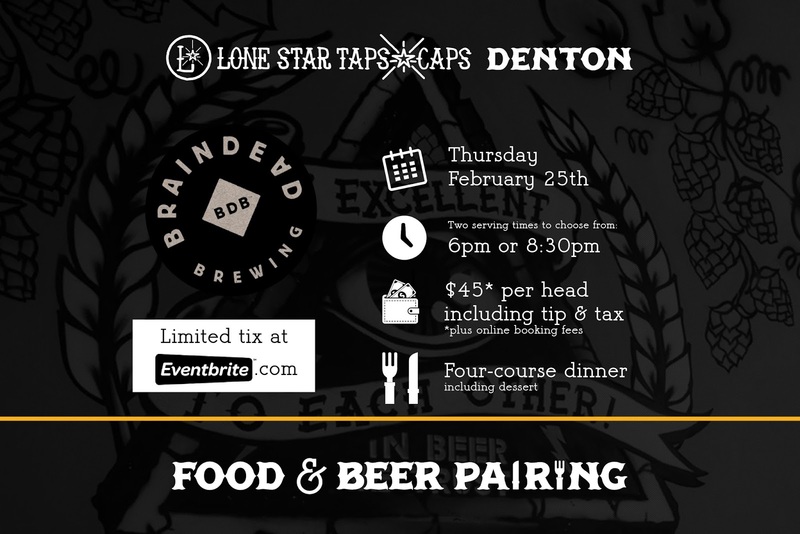 That will change, though, when BrainDead Brewing out of Dallas brings its brand of food and drink to Denton on Thursday, February 25. For one night only, the most talked-about brewpub from Big D will take over the newest craft beer destination to open in 'Lil D for what promises to be "a colossal and epic night," according to owner Rick Ali. "We've wanted to team up with BrainDead for a food pairing for quite some time," Ali says, "but we decided something bigger was needed. Something bigger than just beer. This takeover is the most unique and special one of any we've done before, and we're putting it on in celebration of the brewpub's upcoming anniversary." In addition to BrainDead beers being on tap and available for growler fills, the brewpub's chef, David Pena, will prepare a special four-course dinner to be served at the event (see menu below). Not only that, those in attendance will have the right to purchase limited-release bottles of the BrainDead beers Bent de Garde and Hammer of the Gods for the first time outside the brewpub. "I am truly excited about this one!," says Pena. "The opportunity to highlight some of our unique beers, including our first ever retail bottle release, is something that makes us all proud. Brewmaster Drew Huerter knocked it out of the park with Hammer of the Gods, a beer that's dangerously easy to drink, and Bent de Garde, which is ridiculously complex and delicious. As a close friend of Rick, it has been awesome to watch how he and his father Sam have been true proponents of craft beer. This is going to be the first-ever BrainDead Pop-up, with a unique menu of four courses paired with four of our own beers (with a few surprises as well). You definitely don't want to miss it!" Tickets for the event are $45pp (including taxes and gratuity) and are available now by way of Eventbrite at the link that follows. Note that take-home bottles will be sold separately, and are not included in the ticket price. BrainDead Red (India red ale, 6.0% ABV). Tequila shrimp and pomegranate ceviche with serrano avocado cream. Dry-Hopped Wheat (American-style pale ale with wheat, 4.8% ABV). Roasted brussels sprouts, cactus fruit syrup, pequin chile, cumin seed, cecina beef. Bent de Garde (red wine barrel-aged bière de garde, 8.5% ABV). Rye-battered chicken thigh, red pepper manchego grits, braised collard greens, cabernet pepper cream gravy. Hammer of the Gods (bourbon barrel-aged imperial wheat porter, 11.2% ABV). Stout beer chocolate cupcakes, bourbon vanilla cream, ancho chile pecan brittle, quince and tiger fig jellies.